DESCRIPTION Using a simple dying technique, turn eggs into works of art. A warning, this is messy if working with children. Fingers are apt to get colored and spills just might occur, so plan carefully, protect your surfaces and your clothes. Before you begin set up a drying rack. Four push pins inserted in some foam core with egg space between them works. Your eggs can either be hard boiled or blown. 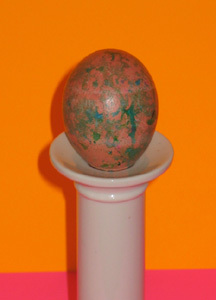 Best perhaps to have the eggs ready before you begin the marbleizing process with children. Using food coloring, set up several dyeing bowls in different colors. Each bowl should contain 3 cups of warm water, 2 tablespoons of white vinegar, and 10 to 20 drops of food coloring. These we'll call dye Number 1. Put together another group of bowls containing the marbleizing dye or dye number 2. This liquid should be no more than a half inch deep. Add 1 tablespoon of olive oil. After submerging your egg in dye number 1, and achieving the color you want, take a fork and swirl dye number two. With a spoon, remove the egg and place it in dye number 2. rolling it around once to streak the egg. With a spoon, remove the egg, and set it on your pushpins to dry. Experiment with the colors to achieve different effects.